Pada yatra or foot pilgrimage to the remote Kataragama shrine is a Sri Lankan tradition harking back to remote antiquity; ancient tradition maintains that the practice began with the Kataragama God himself. Even in times of conflict, like today, earnest devotees still brave hunger, thirst, and scorching sun as well as real dangers. Here, Patrick Harrigan, who has made the Kataragama pada yatra an object of in-depth study since 1972, writes about the pilgrims. 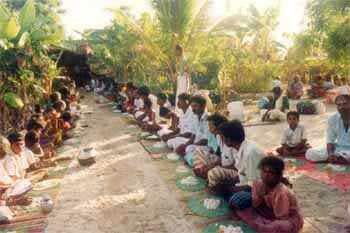 Annadanam or the offering of food is the basis of traditional foot pilgrimage. Traditional annadanam at Tirukkovil, 1998. 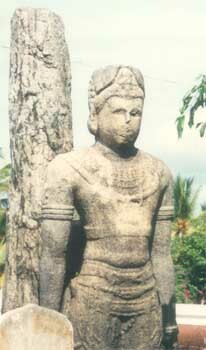 Nowadays, most of the many thousands who visit the legendary jungle shrine of Kataragama travel by vehicle. But many can still recall the days when the only means to reach Kataragama was by foot or by bullock carts. Even today, despite the lure of modern transport, hundreds of dedicated pilgrims stick to the ancient practice of journeying to Kataragama on foot. Foot pilgrimage or pada yatra as it is called, is just one of many sacred traditions associated with Kataragama that have been passed from generation to generation for uncounted centuries. The theme of pilgrimage to Kataragama from points in throughout Sri Lanka, India and even from central Asia appears again and again in traditional lore both in Sinhala and Tamil languages. For instance, Sokari, the heroine of the age old ritual comic opera by the same name, originally came to Lanka from India with her foolish spouse Guru Hamy to obtain the blessing of Kataragama that they might conceive a child, a common theme even today. Sri Lankan Hindus believe that their tender Lord Murugan left India long ago to come and settle in Kathir-kamam (the place of light and love-passion) where his vilaiyātal (divine play) continue even to this day. 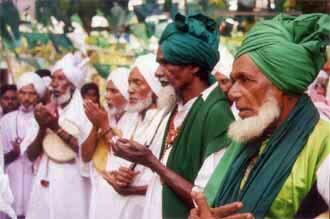 According to Islamic esoteric tradition, Kataragama or Khadirgama is the very place that prophet Moses journeyed to in quest of higher teachings from the undying Servant of Allah, al-Khadir, the legendary 'Green Man'. Even today the same revealing angel is said to be found there, at the place where two rivers meet before the sea (Sura Khalf, verse 61), where he is known as Hayat Nabi, 'the ever-living prophet'. Indeed, as late at the Dutch period, so many Indian faqirs used to walk to Kataragama via Jaffna and the east coast during the Kataragama festival season that Dutch authorities feared the island was being invaded. And, as Buddhists know, the Tathagatas themselves have come to Kataragama with the object of delivering discourses on Dhamma, as Lord Shakyamuni did to good King Mahasena who accepted the Buddha's teaching. Mahasena, too remains present at Kataragama to his day as the powerful spirit of a bodhisatta or 'awakening being' who is always ready to assist those who appeal to him. Hence, pilgrims of today are literally following in the footsteps of a distinguished lineage dating back to remote antiquity. As old as memory itself, the Kataragama Guru Parampara, the sacred transmission of Kataragama, recognises no boundaries or limits, and has included saints, sages, siddhas and bhaktas of every hue and variety. Pal Kudi Bawa and Yoga Swami of Nallur walked in relatively recent times, but many more have walked unknown and unrecognised for centuries. The traditional pada yatra it is said, starts from the ground beneath one's feet, from one's own doorstep or wherever one happens to be when the divine 'call' comes. Starting from our shadowy world of deceptive appearance, the pilgrim's feet keep to the ground even while he or she is making steady progress to the Kingdom of Katir-Kamam, the realm of light and love that exists always in the eternal here and now. As they walk to Kataragama, the traditional pilgrims commonly undertake simple vows of self-denial, thereby affirming their submission to the one and only reality that each understands differently. Thus, one may stop smoking while another may keep a vow of silence. By ancient right, this acceptance, of austerities in the name of a higher principle entitles them to be addressed as swami (lord) or amma (lady). The mere sight of these pilgrims is said to bestow subtle blessings upon whole communities. And yet the pilgrims reckon themselves to be cinna alkal, 'little people' or adiyarkal, Literally slaves to their Lord. 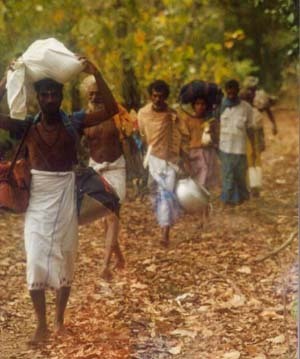 Such pilgrims have traditionally accepted the role of beggars, for traditional has it that Kataragama Skanda, their gurunathan, also walked to Kataragama in the guise of an andi or itinerant beggar. Portrayed in poetry and legends as an ever-youthful master of magic, strategy and surprise, Kataragama Skanda (alias Andi Guru) has provided inspiration for uncounted generations, of storytellers and minstrels. Small wonder that the great spirit of Kataragama, the Kande Yakka of age-old Vedda lore, still enthrals the hearts of millions even into the 21st century. Of all the pilgrimage routes in Sri Lanka, the longest is that from the Jaffna peninsula to Kataragama in the far South. Because the celebrated pada yatra route hugs the eastern seaboard it is also called the Kathira Malai Karai Yatirai or 'coastal pilgrimage to the brilliant peak'. As its name suggest, it is a tradition dating from remote times when Kataragama peak itself was the principal focus of worship. A long trek lies before those who start from the far north. Nearly two months before the great Esala festival in Kataragama, individual pilgrims gather at sacred sites such as Naga Deepa, Nallur or Selva Sannithi to take there solemn vows. Then with a loud chorus of Haro Haro! they proceed as onlookers pause to cheer them on. Generally a swami among them bears with dignity the god's Vel or lance emblem. At least 73 major temples and shrines line the way to Kataragama, and the pilgrims stop at each of them to offer respects. By Poson Poya Day pilgrims assemble at the Vattappalai Kanakki Amman kovil near Mullaitivu for the great Amman festival 45 days before the flag hoistiting at Kataragama. Even as the kap hitaweema ritual of promise is being performed at the Mahadevale in Kataragama, pilgrims are offering at Vattappalai. From there the ritual festivity continues all 45 days to Kataragama. Poets, ministrels, musicians dancers, clowns and ecstatics are spread like a leaven through the concourse as they move in parties often separated from each other and appearing to walk alone across the awe-inspiring landscapes of Sri Lanka. At night there is the welcome glow of campfires, much sharing of food, frequent outbursts of laughter, almost continuous chanting of praise and, of course, the spectacle of wisdom teaching being rehearsed by the elders in the form of stories, songs and dramatic presentations. As late as the 1970's the rank of pilgrims walking southwards would swell to over a thousand singing devotees. People residing along pada yatra routes would anticipate the pilgrims annual arrival, and whole villages would turn out to fete them with food and entertainment offered to the gods and their 'messagers' the pilgrims. Day and night the air would resound with music and laughter. At times, the traditional hospitality could be so overwhelming that pilgrims had to excuse themselves and move on. Along by local residents with offering of cool water, buttermilk or tender coconut to relieve the thirst and discomfort of walking for miles under the scorching tropical sun. The final 60 miles of the journey take the intrepid pilgrims through wild jungle teeming with herds of elephant, deer, sambur, boar and more. Typically the jungle would claim the life of one or more pilgrims who succumb to fever, wild animals or simply get. Those who have pass through, however, bring home stories and memories of night by the campfire under an open sky that will last a lifetime. 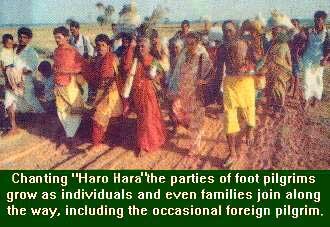 Changing times and social disruptions nearly put and end to the pada yatra, in the early 1980's. 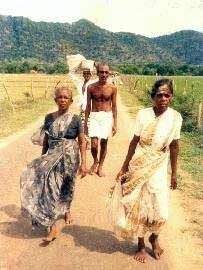 But in 1988, Muttu Kumar Vel Swami, a veteran of over fifty pada yatras, called for earnest devotees to walk with him once again. With the support of the newly created Kataragama Devotees Trust, the pada yatra tradition was not only successfully revived but attracted media coverage in Sri Lanka, India and even in America. In 1988 and succeeding years. Vel Swami led the pada yatra pilgrims through the fear-ridden atmosphere of regions torn by ethnic strife. Never before had such hardship confronted the pilgrims as in those difficult years. Alms-begging, an age-old pada yatra ritual, played a vital role in fending off hunger when there was no organized offering of dana. Even jawans of the Indians Peace Keeping Force and Sri Lanka security forces made offering of puja and prasadam to Lord Skanda and his faithful devotees those days. All the way to Kataragama, offerings are accepted with gratitude, generating goodwill all around. 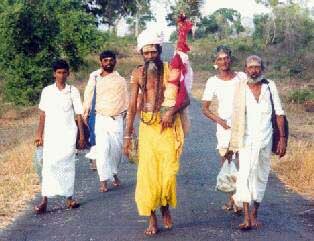 Even with conflict raging in the 1990's hundreds of pilgrims continue to experience the joys and hardships of pada yatra. This year also, despite most adverse conditions, hundreds of devotees will walk again. Some will arrive in time for the flag-hoisting on July 5 while other will come in time for the tirtham or water-cutting ceremony on July 20. Even in such difficult times, a great living tradition here in Sri Lanka. Once again, the swamis and ammas of the Kataragama Guru Parampara invite devotees of all communities to join the pada yatra from Batticaloa or any where on the long road to Kataragama. The author has been acting editor of the Kataragama Research Publications Project since 1989; in 1997 when this was published he walked his eleventh Kataragama Pada Yatra. 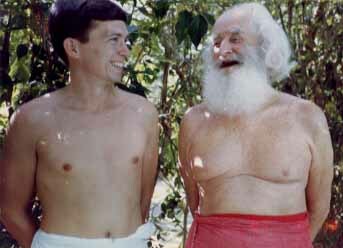 From 1971 he was a companion and student of the late German Swami Gauribala, who walked the Kataragama Pada Yatra 25 times from Selva Sannidhi (Jaffna) to Kataragama.